Alarm Watch Womens. Designer Watch with 12 Alarms. By adding this elegant expansion band to our epill CADEX watch, we offer you a practical and stylish women's watch that will make your life easier and give you many compliments. The watch strap is made of beads that are ornately detailed, intricate and well-crafted 3-strand spacer beads with an antiqued silver finish. Made from a zinc-based alloy, the beads are lightweight but durable. This bracelet is constructed with elastic for a secure and comfortable fit, making it easy to put on and take off of your wrist. It is also easy to remove the watch band, which is secured with lobster clasps. Program up to 12 medication reminders (sound alarm + optional text alarm, no vibration) including reminder text message (name and strength of medication or other prompts). Message scrolls across the display. Programming is done on the watch (excellent easy to understand manual). Never Forget to take your Medications Again! FREE Standard Shipping & Handling (US customers only). Feel Better. Avoid Medication Errors. This e-pill timer is member tested & recommended by National Health & Wellness Club. Medical ID Databank stores critical health information (similar to a medical ID bracelet). Simply press the ALERT button to display: What is a Medical ID Databank? Recommended by doctors, nurses and emergency medical personnel. HIPAA Compliance Notice: This e-pill device, when used, may disclose confidential patient information. 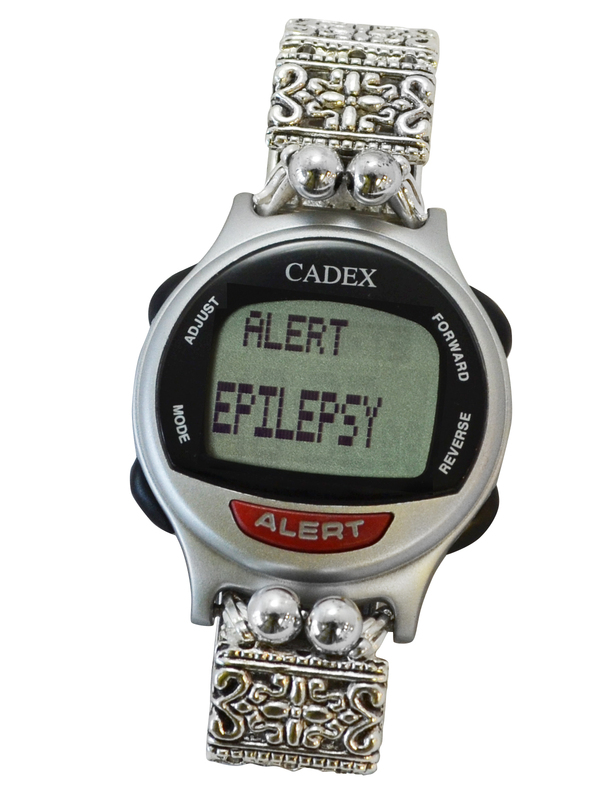 The e-pill CADEX's reminder system is very functional and lets you turn off immediate beeping, and then gives you a subtle double beep (medical snooze) every three minutes until you have taken your medicines. It has a practical master switch to turn off all alarms (when you are in church or meetings etc.) Never forget to take your medications again with this patented reminder alarm watch. 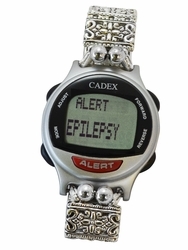 Order your CADEX medication reminder watch from e-pill today! We offer FREE standard Shipping & Handling (U.S. customers only) & a 30-Day Money Back Guarantee.